A Cartoon from the KNOTS 2008 Annual Supplement (6/08 - 6/09)! 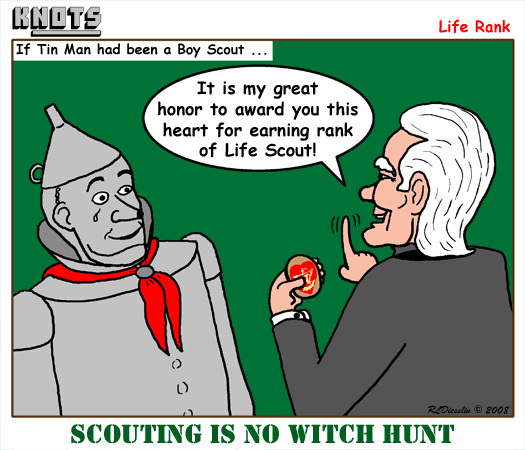 Copyright (c) 2008 Richard Diesslin, cartoonist of the KNOTS or Not Scouting Cartoon Collection! and the KNOTS 2008 Annual Supplement and KNOTS Volume II (to be released in September). Used by permission. This image may not be used or reproduced in any form without the express permission of the owner. Permission is usually granted for local troop/pack hardcopy newsletter use, but you need to ask (it's free)! Also, higher resolution images (color and black-and-white) and permissions are available with purchase of the KNOTS or Not Scouting Cartoon CD! or one of the supplements.